The 1971 FB season saw a fabulous battle for the title between Alan Lader, the previous year's runner up, in his Brabham BT29 and Kiwi Bert Hawthorne in the Tui, a one-off Formula 3 car that had been converted to Formula B by its builder Allan McCall. Lader won the opening two rounds, the second only after the stewards needed to review the video of the race the check the results. Hawthorne then took over with a flag-to-flag win in Mexico City after Lader crashed on the opening lap, writing off his faithful Brabham BT29. Fred Opert supplied a new one but Lader couldn't stop Hawthorne winning from pole at Edmonton and Brainerd. However, the Brainerd victory had been snatched at the very end after Freddie Van Buren had led almost the whole race in his Chevron B18. 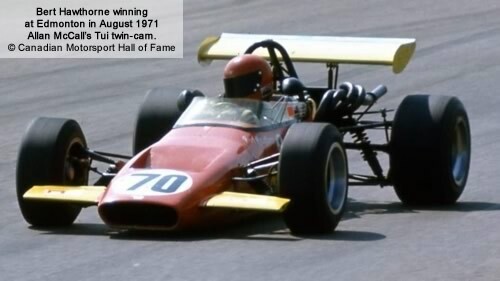 The points Lader had accumulated put him five points ahead going into the last race at Road America and he also had a new car, the latest Brabham BT35. The Kiwi led yet again with Lader back in third but after seven laps, Hawthorne was off the track, his brakes having failed, and Lader cruised home to win his third race of the season and the overall title. The championship table was constructed from results after Competition Press & Autoweek's end-of-season review (CP&A 1 Jan 1972 p10) showed that the usual 20-15-12 points system was in use. Formula B continued to expand at SCCA Divisional level in 1971. The top three from each of the seven SCCA Divisions were invited to the Runoffs in November to decide a national champion. The top three from each Division were invited to the Runoffs	in November to decide a national champion. The most competitive Division was Central with seven brand new cars appearing, followed by Northeast with five, Midwest with four, NorPac with three, Southeast with one. The Southern Pacific table isn't available but two of the three Runoffs qualifiers had 1971 cars. For comparison, approximately eight new cars appeared in the 1971 British Formula Atlantic series. The Pro series results here have been compiled by using reports from the weekly US newspaper Competition Press & Autoweek plus entry lists from race programs where available. The results are complete but qualifying times are rarely known and entry numbers are missing for five of the six races. Please get in touch if you have any programs from these races.